BUYING TIPS - GOLF CARS UNLIMITED, LLC. It’s easy to get caught up in the excitement of purchasing a golf car. Make sure you take a few minutes to learn the basics so you don’t end up regretting your decision! The first rule of shopping for a golf car is to take your time and ask plenty of questions. ​New or Used (Refurbished)---With a new car you get the peace of mind of knowing that you are the first owner of the car with a manufacturer standing behind the warranty. For an electric car, this also means that you know the history of the batteries. Likewise, a new car provides the latest in technology, performance and comfort. There are also excellent finance incentives for new cars regularly offered by the manufacturers that are not available for used cars. ​A used or refurbished car can be an economical choice, but BUYER BEWARE. It has unfortunately become a standard practice for some dealers in our industry to not fully disclose the year of the model car and in the case of electric cars, the age of the batteries. Purchasing a used or refurbished car requires a buyer that is educated to ensure that you are getting what you have paid for and that you will be 100% comfortable with your purchase. A refurbished car is primarily cosmetically refurbished, but typically still has most of or all of the original working components (motor or engine, controller, solenoids, transaxle, etc.). See below to learn how to decipher the year model of the car and batteries. If you can’t find the serial number on the car, consider that to be an alarming red flag. The year of the car is a strong indicator of the amount of wear and tear the mechanical parts have endured, so it is imperative that when you are comparing cars and prices you are aware of the year of the car. Batteries need to be tested on a discharge machine to know how long they will run. Batteries tested with a standard load tester only tells if the batteries are not good, it will not tell you the range you will get from the batteries. It is also necessary to learn how your dealer will service your car should you have any problems. Does the dealership have a service department or will they out-source the repair work? There are two primary considerations when making this choice – the application the car is being used in and the initial cost of the car. For new cars, gas and electric cars are typically very close in price. Due to the lack of supply of used gas cars in the market, used gas cars will typically run several hundred or more dollars than a comparable electric car. There are many instances where the location of the car’s use will mandate that it be electric. Be sure to check with any local laws or camp ground rules that would govern the car’s use. Gas Car Pros – all day use without the time needed to recharge, no access to an electrical outlet is necessary. Very little routine maintenance is required for normal use. Gas Car Cons – gas cars are nosier and do emit a slight odor from their exhaust. Electric Car Pros – near silent operation, no exhaust fumes and smooth acceleration. Electric Car Cons – requires regular charging and maintenance of water levels in the batteries. Batteries for an electric car, the age of the batteries is a significant factor to consider when purchasing. Battery life is dependent on usage and the level of maintenance provided to ensure that they have proper water levels at all times. Batteries typically last 4-6 years based on the usage and maintenance, however batteries can fail much earlier if not properly cared for. A quality set of replacement batteries will run approximately $800. 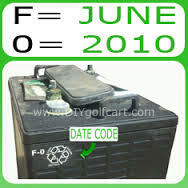 The main suppliers to the golf car industry are Trojan, US Battery and Crown (privately labeled as a Club Car product). The date code can be found either stamped into one of the terminals or on a sticker. The code will have a letter followed by one or two numbers. The letter indicates the manufacturing month and the number indicates the year. For example, an A5 or A15 code would be January of 2015. Likewise, a G7 or G17 indicates July 2017 production. Serial Number Decoding for Current Model Cars (2007-up)Club Car – the serial number will be located in one of three places. Just to the right of the top of accelerator pedal, in the dash on the passenger side or near the passenger’s right foot. It will start with two letters followed by 10 digits. The letters indicate the model number and the first two digits indicate the year model of the cars. Below is an example of a 2009 model car. 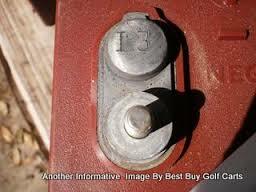 E-Z-GO – the serial number and manufacturer date code will be found in one or two of the following locations. On the base of the steering column, behind the driver’s left leg position on the body, under the front cowl near the top of the shock tower on the driver’s side, in the dash on the passenger’s side or under a plastic black flap directly behind the seating area when the seat is raised. The manufacturer date code is the key piece of information. It will have a letter followed by three or four numbers. The last two numbers indicate the model year, i.e. H3012 would denote a 2012 model. If only the serial is visible, you can go to www.shopezgo.com and go to the link ‘Shop for your exact E-Z-GO Make, Model and Year’. Once you enter the serial number it will provide you with the make, model and year of the car. Below is an example of a 2014 model car with date code K2814.